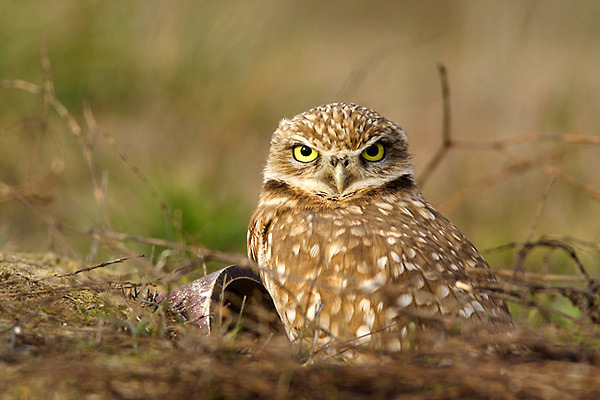 This article demonstrates some of the most interesting burrowing owl facts.The burrowing owl belongs to the Athene cunicularia family and it is extensively distributed all throughout North and South America. These types of small owls can often be found in open areas like grasslands, agricultural lands, rangelands, and deserts. They largely prefer to subside in the dry areas with less vegetation. As the name indicates, these owls make holes in trees or grounds and use them as roosting place. Not many other owls are active during the daytime because of their nocturnal nature; however, burrowing owls are known to forage at day. That doesn’t mean they roost at night, these owls hunt at dusk owing to their super visionary advantage. 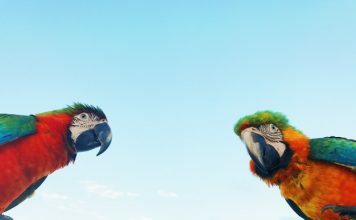 These birds have been declared as endangered species in Canada and Mexico. These yellow eyed birds are 19 – 28 cm (7.5 – 11 inches) long. The wingspan of burrowing owls measures around 50.8 – 61 cm (20.0 – 24 inches). These owls weigh about 140 – 240 grams (4.9 – 8.5 oz). As compared to the robin birds, these owls are slightly greater in size. The males and females have the same appearances and it’s not easy to figure out which one is which. There are little markings at the burrowing owls’ body. The chicks do not have any notable spotting. The legs are slightly greater in comparison to the other species of owls. The weight of the female is greater as against the male; however, latter is longer than the former. The males tend to remain outside their burrows most of the time during daytime which is why they have light plumage as against females. 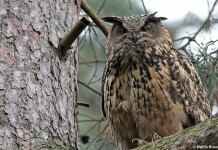 Read More: How much do owls Eat? Where Do Burrowing Owls Live? Burrowing owl facts about its habitat reveal that these birds make holes in grounds and trees. 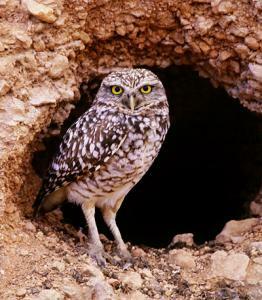 Burrowing owls habitat is commonly found in open areas like deserts and forests. However, deforestation in the recent years, the population of burrowing owls has been dramatically reduced. On the positive side, these owls have not faced such reduction in South America. They are also commonly found in the western Canada and Mexico. 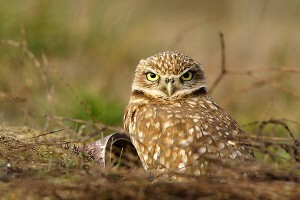 Burrowing owls are widely distributed all throughout Florida, Caribbean, Brazil, and Patagonia. 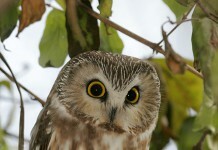 Owls living in these places also migrate toward Mexico in cold days. These kinds of owls have a lifespan of 8 – 9 years in the wild; whereas, under captivity they can live up to 10 years. Unfortunately, many species have been killed while crossing roads. The predators of burrowing owls include snakes, coyotes, and badgers. Wild dogs and jungle cats are often known to kill these owls. 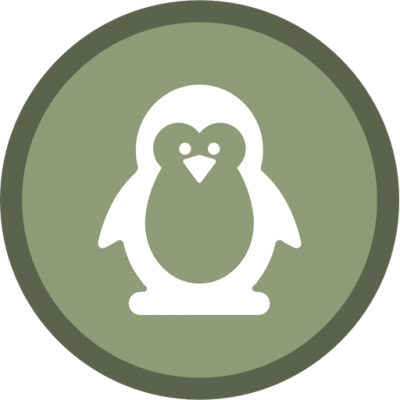 What Do Burrowing Owls Eat? The study of burrowing owl facts about its diet show that these birds predominantly hunt insects, and feed on invertebrates, small rodents, lizards, toads, and frogs. They are capable to ingest prey three times of their own size. They also eat termites, crickets, spiders, and ground beetles. Very few owl species are fond of eating fruits and plants seeds. Burrowing owl is one of them. They are also known to eat mourning doves. Burrowing owl facts about its reproduction led us to believe several owls’ insights. March and April are the two months when these owls start constructing their nests. They make partners for long time even though some males have more than one partner. They do not hesitate to approach residential areas of humans and are often found in farms, canals, and in proximity to homes. Burrowing owl facts show that these types of birds are akin to soft lands where they can dig their holes easily. During the breeding period, these owls lay 1 – 2 eggs. The clutch size comprises 4 – 12 eggs. 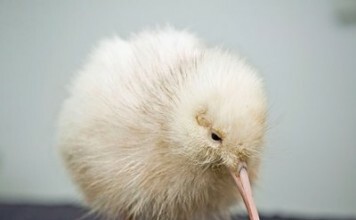 The incubation (keeping warm) period lasts for 3 – 4 weeks. The males are normally responsible for bringing food. 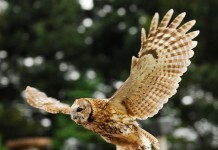 The young owls begin their first flight after 28 – 30 days. These chicks remain with their parents for about 80 – 90 days.